Several years ago, I wrote an article for Diabetes Self-Management about the management of high blood sugar after meals. It was called “Strike the Spike” and no article I’ve ever written has led to greater reader response. To this day, I still receive calls and e-mails thanking me for offering practical answers to this perplexing challenge. I’ve even been asked to speak on the topic at some major conferences. So when presented with the opportunity to readdress the issue, I jumped at the chance. A lot has changed in recent years: we know more than ever about the harmful effects of after-meal blood sugar spikes, but we also have a number of potent new tools and techniques for preventing them. And now that I know how meaningful this topic is to so many people, I’ll do my absolute best to provide some answers. What’s a spike, and why do they happen? After-meal, or “postprandial,” spikes are temporary high blood glucose levels that occur soon after eating. It is normal for the level of glucose in the blood to rise a small amount after eating, even in people who do not have diabetes. However, if the rise is too high, it can affect your quality of life today and contribute to serious health problems down the road. The reason blood glucose tends to spike after eating in many people with diabetes is a simple matter of timing. In a person who doesn’t have diabetes, eating foods containing carbohydrate causes two important reactions in the pancreas: the immediate release of insulin into the bloodstream, and the release of a hormone called amylin. The insulin starts working almost immediately (to move glucose out of the bloodstream and into cells) and finishes its job in a matter of minutes. The amylin keeps food from reaching the small intestine too quickly (where the nutrients are absorbed into the bloodstream). As a result, the moment blood glucose starts to rise, insulin is there to sweep the incoming glucose into the body’s cells. In most cases, the after-meal blood glucose rise is barely noticeable. However, in people with diabetes, the situation is like that of a batter with very slow reflexes facing a pitcher who throws 98-mph fastballs: The timing is all fouled up. Rapid-acting insulin that is injected (or infused by a pump) at mealtimes takes approximately 15 minutes to start working, 60–90 minutes to “peak,” or reach maximum effectiveness, and 4 hours or more to finish working. (Afrezza, an ultra-rapid-acting inhalable insulin, begins working within 12–15 minutes of inhaling it, peaks at about 30 minutes, and lasts for about 3 hours.) Meanwhile, amylin is either produced in insufficient amounts or not at all, so the movement of food from the stomach to the intestines is not slowed the way it should be. As a result, food digests even faster than usual. This combination of slower insulin and faster food can cause the blood glucose level to rise quite high soon after eating. 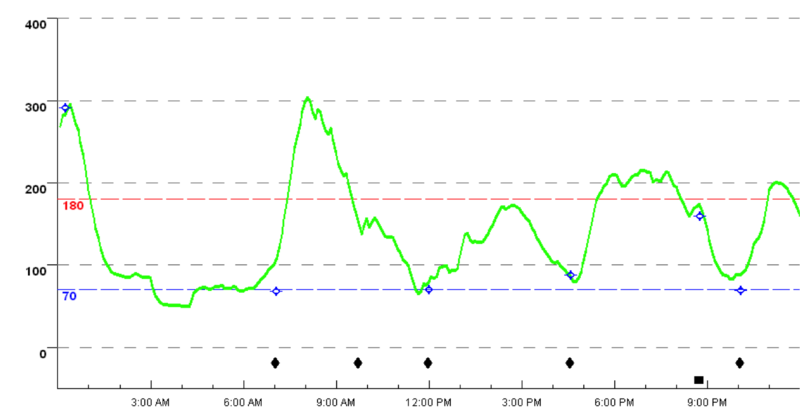 Once the mealtime insulin finally kicks in, the high is followed by a sharp drop. Why are spikes a problem? Even though after-meal blood glucose spikes are temporary, several spikes a day, day after day, can raise your glycosylated hemoglobin, or HbA1c level, and a high HbA1c level has been shown to raise the risk of long-term diabetes complications. Your HbA1c test result reflects your average blood glucose level for all times of day (before and after meals) over the past two to three months, with the more recent weeks influencing the result more than earlier weeks. So if your pre-meal blood glucose average is 130 mg/dl for a given three-month period, and your post-meal average is 240 mg/dl, your HbA1c will probably reflect an overall average somewhere in the middle of these two numbers. Interestingly, research has shown that for people with an HbA1c below 7.5%, post-meal blood glucose readings have a greater influence on HbA1c than pre-meal readings. In other words, lowering your pre-meal readings will only get you so far. If you want your HbA1c level to be as close to normal as possible, you need to pay attention to your after-meal numbers as well. The long-term effects of high blood glucose levels after meals have been studied extensively. For people with Type 1 diabetes, significant after-meal rises have been shown to produce earlier onset of kidney disease and to accelerate the progression of existing retinopathy, the eye problem most commonly associated with diabetes. In people with Type 2 diabetes, high blood glucose after meals is a risk factor for cardiovascular problems. Recently, post-meal spikes and glucose “variability” has been associated with diminished brain function and an increased risk of dementia. But the problems are not limited to long-term complications. Any time blood glucose levels rise particularly high, even temporarily, quality of life suffers. Energy decreases, brain function falters, physical and athletic abilities become diminished, and moods become altered. An Australian study of young people with Type 1 diabetes indicated that short-term high blood glucose negatively affects thinking performance, coordination, and emotions and moods. A study conducted on people with Type 2 diabetes showed that sharp rises in blood glucose level slowed mental performance, lowered attention, reduced energy levels, and led to feelings of sadness and tension. And don’t forget: What goes up must come down. The rapid blood glucose decline that usually follows a post-meal spike can cause false hypoglycemia symptoms. This is referred to as “relative hypoglycemia.” The sharp drop from a high blood sugar to a normal level can fool the brain into thinking that there is a crisis, and low blood sugar symptoms can result. Additionally, the effects of a bout of post-meal high blood glucose do not go away immediately when blood glucose returns to normal. Each episode of high blood glucose can alter the way certain genes function, resulting in the production of harmful chemicals called free radicals, which cause inflammation and damage to the linings of the blood vessels for hours, if not days. So clearly, post-meal spikes represent a challenge worthy of attention. The exact timing of blood glucose spikes can vary from person to person and meal to meal. However, on average, after-meal peaks tend to occur about one hour and 15 minutes after the start of a meal. So checking your blood glucose (using a blood sample from a fingerstick) about an hour after finishing a meal should provide a good indication of how much of a spike is taking place. Check before and after breakfast, lunch, and dinner several times to determine how much of a spike is taking place after each of these meals. It is most common to see significant spikes after breakfast, but check after each meal at least a few times just to see what is happening. Personal CGM systems can be purchased for long-term or ongoing use. Some specialized diabetes centers offer them on a temporary loaner basis just to get a sense of what is happening with your blood glucose at all times. CGM systems include a tiny disposable sensor filament placed just below the skin, a small transmitter attached to the sensor, and a receiver that displays your data. The receiver can take the form of a handheld device, an insulin pump, a smartphone, or even a smartwatch. The data from all of the systems is uploadable to a computer for analysis of the information. Whether you use fingersticks or a CGM, when interpreting your numbers, take your pre-meal readings into account. A high or low reading before the meal will usually contribute to a higher reading after the meal. For example, a pre-meal blood glucose of 210 mg/dl followed by a 1-hour post-meal reading of 240 mg/dl shows just a 30-point rise, whereas a 110 mg/dl followed by a 240 mg/dl shows a 130-point rise. Lows before meals usually affect rates of digestion and may trigger a hormonal “rebound” to produce much higher readings. So exactly how high is too high after a meal? There is no universal consensus on this issue. The American Diabetes Association recommends keeping blood glucose below 180 mg/dl one to two hours after the start of a meal. The European Diabetes Policy Group recommends keeping it below 165 mg/dl at the peak, and the American Association of Clinical Endocrinologists and the International Diabetes Federation recommend keeping it below 140 mg/dl after eating. However, no specific guidelines are provided by any of these groups for Type 1 versus Type 2 diabetes, insulin users versus non-users, or children versus adults. After-meal readings that are consistently above these levels should be addressed by you and your health-care team (see strategies in the sections below). Another way to assess after-meal blood glucose control is with a blood test trade-named GlycoMark. The test measures the level of a specific type of sugar (1,5-anhydroglucitol, or 1,5-AG) that becomes depleted whenever the kidneys are spilling glucose into the urine; this typically occurs when blood glucose exceeds approximately 180 mg/dl. The test result reflects blood glucose levels over the prior one to two weeks. A low GlycoMark score means that you are spending considerable time with blood glucose levels above 180. So if your HbA1c is normal (or low) and your GlycoMark is also low, you are likely spiking quite a lot after meals. A common approach to lowering after-meal blood glucose spikes is to take more insulin. But unless blood glucose levels remain high for three to six hours after eating, taking more insulin is not going to solve the problem. In fact, increasing mealtime insulin will most likely result in low blood glucose before the next meal. Choose the right insulin. The right insulin program can make or break your ability to control after-meal spikes. In general, insulins and other medicines that work quickly and for a short time will work better than those that work slowly over a prolonged period. 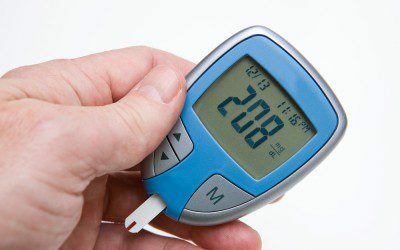 For instance, rapid-acting insulin analogs (brand names Humalog, NovoLog, and Apidra), which start working 10–15 minutes after injection and peak in about an hour, will cover the after-meal blood glucose rises much better than Regular insulin, which takes 30 minutes to begin working and 2–3 hours to peak. Newer ultra-rapid insulins, such as Fiasp (insulin aspart), works even faster, with an onset and peak occurring 8–10 minutes earlier than traditional rapid-acting insulins. The way insulin is administered can dramatically affect its speed of action. Afrezza (insulin human inhalation power) is an inhaled insulin formulation that can be used at mealtimes. Because the dry powder is absorbed through the lungs (rather than having to go through the fat layer below the skin), its onset and peak are much earlier than injected insulin (it takes 12–15 minutes to begin working and peaks in about 30 minutes). Research has also shown that injected insulin can work much faster when the injection (or infusion) site is warmed. This can be accomplished by rubbing the site, immersing in warm water, or exercising the muscle near the site. Warming the site causes the blood vessels near the skin to dilate, which allows the insulin to absorb more quickly. By the way, smoking causes the blood vessels to constrict, so quitting smoking might improve your post-meal blood sugar (in addition to helping you and those around you to live longer). If you use a morning injection of NPH insulin to “cover” the carbohydrate eaten in the middle of the day, your blood glucose level after lunch and after any daytime snacks is likely to be very high. This is also the case if you take a premixed insulin (75/25, 70/30, or 50/50) twice daily. For fewer spikes, consider taking a rapid-acting insulin before each meal or snack and using a long-acting “basal” insulin such as Lantus, Levemir, Toujeo, or Basaglar for coverage between meals. Time your bolus insulin properly. For people who take rapid-acting insulin at mealtimes, the timing of the bolus can have a huge impact on after-meal blood glucose levels. Boluses given too late to match the entry of glucose from dietary carbohydrates into the bloodstream can produce significant blood glucose spikes soon after eating. A properly timed bolus, on the other hand, can result in excellent after-meal control. Unless you have gastroparesis (slowed stomach emptying, usually caused by nerve damage), it is best to give bolus insulin doses before eating. How long before? It depends mainly on what you are eating and on your pre-meal blood glucose level. Figuring out the pre-meal blood glucose part is fairly straightforward: the higher your blood glucose, the earlier the bolus should be given. If your pre-meal blood glucose is well above your target, it is best to give the bolus and then wait at least 30 minutes before eating. Near your target blood glucose? Wait 15 minutes. Below target? Either take the bolus and eat right away, or take the bolus after eating. Does earlier bolusing make a difference? Absolutely. Research has shown that simply giving mealtime boluses before eating rather than after eating can reduce the post-meal spike by about 45 mg/dl. Bolus for the basal. For people who use insulin pumps, one way to have more insulin working right after eating and less working several hours later is to give what John Walsh, coauthor of the Pumping Insulin books, calls a “super bolus.” This is done by substantially reducing the basal rate for 3 hours before eating, then adding the amount of insulin that wasn’t given as basal insulin to the normal pre-meal bolus. For example, if your normal basal rate in the morning is 0.6 units per hour, you could set a temporary basal rate of 10% (90% reduction), for the 3 hours before breakfast, then bolus an extra 1.8 units at breakfast. Choose the right medication. Two classes of injectable hormones, GLP-1 agonists (exenatide [Byetta, Bydureon], liraglutide [Victoza], albiglutide [Tanzeum], dulaglutide [Trulicity]) and amylin mimetics (pramlintide [Symlin]), have powerful effects on post-meal blood sugar. Both GLP-1s and Symlin slow gastric emptying and keep carbohydrates from raising the blood sugar too quickly after meals. Symlin, which is a replacement for the amylin hormone (which is lacking in people with diabetes), also helps to diminish appetite and blunt post-meal glucagon secretion. GLP-1s blunt appetite and promote the growth of insulin-producing cells in the pancreas of those with Type 2 diabetes. So both can contribute to better post-meal blood glucose control. Your choice of oral medication can also impact your after-meal control. Sulfonylureas (glyburide, glipizide, glimepiride) stimulate the pancreas to secrete a little extra insulin throughout the day, without regard to meal timing. Because these medications fail to concentrate the insulin secretion at times when it is needed most, after-meal blood sugars can run very high. There are alternative medications called meglitinides (epaglinide [Prandin], nateglinide [Starlix]) which also stimulate the pancreas but do so in a much faster and shorter manner. When taken at mealtimes, meglitinides produce better after-meal control than sulfonylureas. Another class of oral diabetes medications (alpha-glucosidase inhibitors) improve after-meal control by partially blocking the transport of sugars across the intestines and into the bloodstream. However, these medications can sometimes cause gas, bloating and stomach upset, so the pros don’t always outweigh the cons. Think lower GI. As mentioned earlier, the glycemic index is a rating of how quickly a food raises the blood glucose level. While all carbohydrates (except for fiber) convert into glucose eventually, some forms do so much faster than others. Many starchy foods (such as breads, cereals, potatoes, and rice) have a high glycemic index; they digest easily and convert into blood glucose quickly. However, some starchy foods (such as pasta, beans, and peas) have lower glycemic index values. Foods that have dextrose in them — such as glucose tablets and gel and candies such as SweeTarts, Smarties, Spree, Runts, Nerds, and AirHeads — tend to have a very high glycemic index. Table sugar (sucrose) and fructose (fruit sugar) have moderate glycemic index values, while lactose (milk sugar) is slower to raise blood glucose. A number of books, notably Dr. Jennie Brand-Miller’s Glucose Revolution series, contain extensive information about the glycemic index, along with lists of glycemic index values for hundreds of foods. Foods that contain soluble fiber (such as legumes, oats, and psyllium) are digested more slowly than low-fiber carbohydrate foods and than foods that are high in insoluble fiber that has been finely ground, such as whole wheat flour. High-fat foods are digested more slowly than low-fat foods. Solids are digested more slowly than liquids. Cold foods are digested more slowly than hot foods. Under-ripe and undercooked foods are digested more slowly than fully ripe or well-cooked foods. Whole foods (such as unprocessed grains, legumes, and dried beans) are digested more slowly than milled or processed foods. Another food property that affects the rate of digestion is acidity. This is why sourdough bread has a much lower glycemic index value than regular bread. Research has shown that adding acidity to a meal in the form of vinegar (straight or consumed as part of a salad dressing or other condiment) can reduce the one-hour post-meal blood glucose rise by 50% or more. This table shows some examples of lower-glycemic-index substitutes for common high-glycemic-index foods. Split your meal. The amount you eat has the greatest effect on your blood glucose level after you eat. 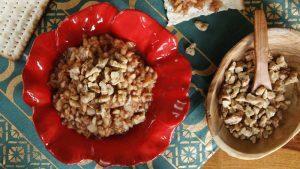 One way to lower your blood glucose rise after meals, therefore, is to eat less. But you don’t have to starve: instead, save a portion of your meal for a “snack” one or two hours later. That way, you get all the food you need, but it doesn’t raise your blood glucose all at once. If you use mealtime insulin, you should still give yourself your full mealtime dose before eating any of the meal. For example, if you normally have a bowl of cereal and juice for breakfast, you would take enough insulin to cover both, but then just eat the cereal for breakfast, and postpone the juice until mid-morning. Get moving. Physical activity after eating can reduce post-meal spikes in a number of ways. If you took insulin before your meal or snack, the enhanced blood flow to the skin surface caused by exercise is likely to make the insulin absorb and act more quickly. Muscle activity also diverts blood flow away from the intestines, resulting in slower absorption of glucose into the bloodstream. In addition, the glucose that does enter the bloodstream is likely to be used by the working muscles, rather than stored for later use. How much activity is required to experience these benefits? Not much. Ten or 15 minutes (or more) of mild activity will usually get the job done. The key is to avoid sitting for extended periods of time after eating. Instead of reading, watching TV, or working on the computer, go for a walk, shoot some hoops, or do some chores. Try to schedule your active tasks (housework, yardwork, shopping, walking pets) for after meals. Also attempt to schedule your exercise sessions for after meals. On “date nights,” resist the urge to sit and talk for hours or to head straight for a movie. Instead, go out dancing, bowling, or skating. Prevent hypoglycemia. Low blood glucose is problematic in many ways. One of the body’s typical responses to hypoglycemia is to speed up the rate at which the stomach empties. That means food digests and raises blood glucose even more rapidly than usual. While this is certainly desirable when you’re low, it does contribute to post-meal spikes. Preventing hypoglycemia before meals and snacks, therefore, is yet another effective strategy for controlling post-meal blood glucose levels. Given the many short- and long-term benefits of post-meal blood glucose control, it is certainly worth the effort to start measuring and evaluating your after-meal control. If your blood glucose levels are higher than they should be, talk with your health-care team about new or different medical treatments that might help. And take a look at your personal choices in terms of food and activity. Even without a perfectly functioning pancreas, there is still a multitude of options for tackling those spikes!